For the month of August 2011, the average exchange rate between SGD and Myanmar Kyat was 603.2258 Ks/SGD (43.0323 down from previous month average rate), highest was 640 Ks/SGD on 1stand 2nd of August and fell lowest till 558 Ks/ SGD on 23rd of August. 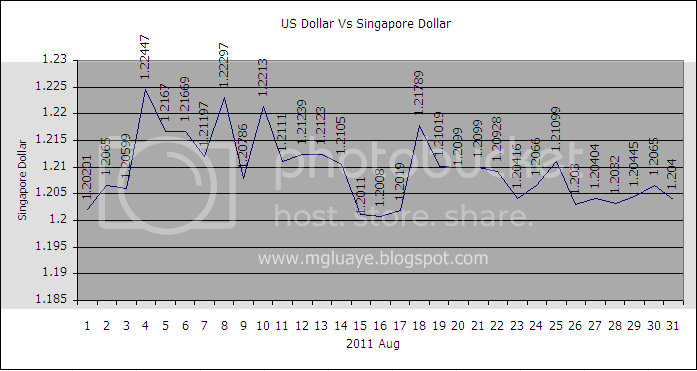 For USD vs SGD, the average rate for the month of August was 1.2094 SGD/USD (0.0068 down from previous month average rate), highest 1.2247 on 4th of August and lowest 1.2008 on 16th of August. 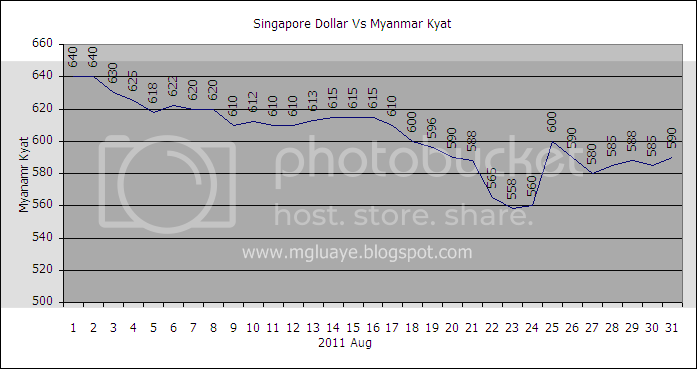 The rate of SGD Vs Myanmar Kyat was taken from daily record on MGLUAYE'S PAGE sidebar and rate of USD Vs SGD was taken from http://www.exchange-rates.org/ . The exchange rate shown on the chart are for informational purpose only. The data shown on these charts especially on SGD Vs Myanmar Kyat are taken from various sources so that we will not take any responsibilities for referring these data to use as official purposes. F*ckin’ tremendous things here. I am very glad to see your article.